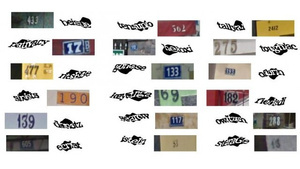 Last weekend a group of hackers unveiled Stiltwalker, a hack that subverts the reCaptcha system Google uses to protect its services from bots with 99 percent accuracy. But just hours before the group was set to present their hack at the LayerOne conference Google patched it up so it wouldn’t work anymore. What the hackers-identified only as C-P, Adam, and Jeffball-learned from analyzing the sound prints of each test was that the background noise, in sharp contrast to the six words, didn’t include sounds that registered at higher frequencies. By plotting the frequencies of each audio test on a spectogram, the hackers could easily isolate each word by locating the regions where high pitches were mapped. reCAPTCHA was also undermined by its use of just 58 unique words. Although the inflections, pronunciations, and sequences of spoken words varied significantly from test to test, the small corpus of words greatly reduced the work it took a computer to recognize each utterance. Campaign season is heating up, and in Michigan’s 3rd congressional district the Democratic primary battle pits an entrenched 60-year-old against a young social media upstart. 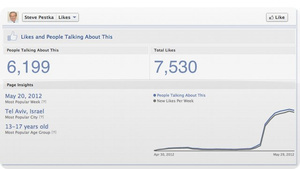 Guess whose campaign has more Facebook Likes? Old man Steve Pestka’s. He’s got the best Facebook friends money can buy. If you’ve ever stopped and wondered why you obsessively check in to Foursquare wherever you go, Rachel Binx and Sha Hwang have the answer. They’ve come up with a unique jewelry line that lets Foursquare users create custom geometrical designs based on where they’ve been. 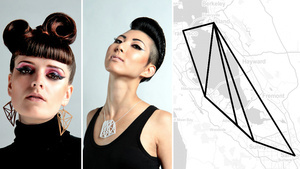 On their website, meshu, you can either login to Foursquare and use its online editor to choose what locations you want to shape your piece, like a connect the dots puzzle. Or, you can just load a map of any city and manually add points anywhere you want. 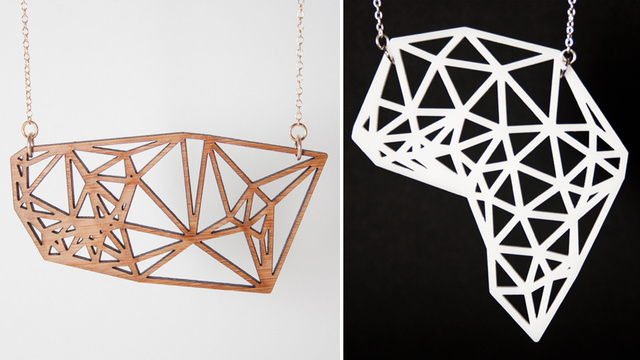 The creation process lets you be as abstract as you want, and once you’re finished you have the choice of creating earrings, necklaces, or cufflinks which are all manufactured through 3D printing or laser cutting processes. So for somewhere between $75 and $150, you can claim the title of mayor of questionable taste. This note appeared first on Business Insider Intelligence, a new research and analysis service focused on mobile computing and the Internet. Sign up for a free trial here. 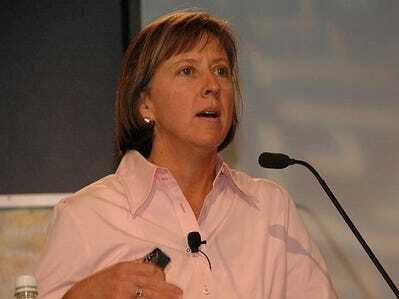 Mary Meeker, a former Morgan Stanley analyst now at venture capital firm Kleiner Perkins, is known for her periodic “state of the Web” presentations. Yesterday, she delivered her latest one at the D10 conference, and made it available on the Web at the same time. The entire deck is long — 112 slides. It covers a ton of topics, including mobile stats, advertising, macroeconomic trends, and a long section on “reimagination” of various analog forms in the digital world (for instance, Path is a digital diary). To save you time, we’ve picked out the most interesting and useful slides with statistics about the mobile industry. The commentary caption above each slide is ours, not Meeker’s. 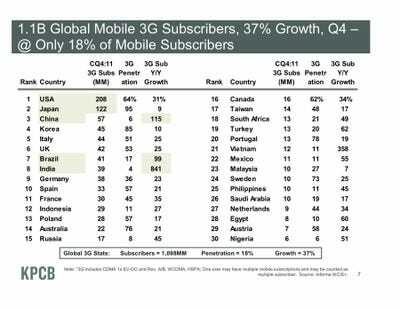 Here are statistics on 3G growth and usage in 30 countries. The fast growth in Brazil, India, and China suggest that fast-growing emerging economies will move to 3G more quickly than developed economies did. 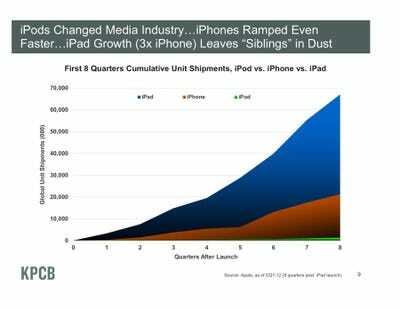 The iPad is taking off much faster than the iPhone and iPod did. The iPhone established the market for apps, which the iPad is taking advantage of. Apple’s brand is also stronger than it was five years ago. 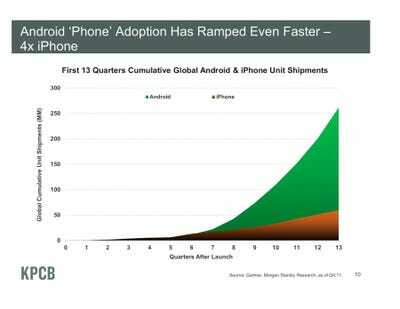 Android is taking off faster than the iPhone. That’s mainly because it’s free, and because the iPhone helped establish the consumer smartphone market and a lot of the necessary features, like a touch screen with keyboard. You probably don’t need a 112 slide PowerPoint presentation from Mary Meeker and the venture capital firm KPCB to tell you this, but the Internet, she’s getting bigger. Every year more and more people sign on and, not surprisingly, many of the 663 million netizens added over the last three years have come from developing nations like China and India. In fact, since 2008, China has accounted for almost a third of new web users, adding 215 million to the connected population. What also shouldn’t come as a shock, is that the boon in connectivity is also being pushed by the broader availability of 3G data connections. 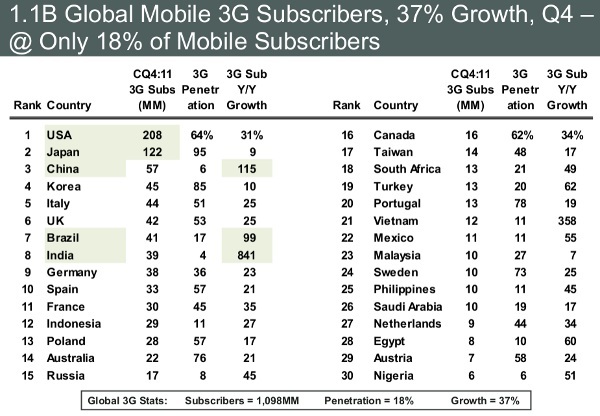 Areas like India, China and Vietnam have all seen triple digit percentage growths in 3G penetration since last year. Wireless broadband has really exploded in India, where year over year growth in subscribers was 841 percent, though, that still only equates to a four percent penetration rate. For more info about the state of the internet and the world’s 1.1 billion 3G subscribers hit up the source link. Internet Trends report finds online growth driven by China and India, users increasingly mobile originally appeared on Engadget on Wed, 30 May 2012 22:17:00 EDT. Please see our terms for use of feeds. English entrepreneur and chairman of The Virgin Group Sir Richard Branson thinks that your tap water is dirty. So much so, in fact, that he’s partnered up with Strauss Water to get one of his new purifiers into your home and onto your countertop. The colorful Virgin Pure T6 (£299, $466) can dispense 1.3 liters of chilled H2O per minute, or 1.4 liters of hot water that’s stored internally. The T7 (£379, or $591) delivers a bit more swagger to your crib with its minimalist, tapered design that offers 50 percent faster cold water flow. It even gets a small power bump to heat your hot water more quickly than its less-expensive sibling. It all sounds well and good, but we’ll really be impressed when Virgin crams one of these into its seatbacks in first class. 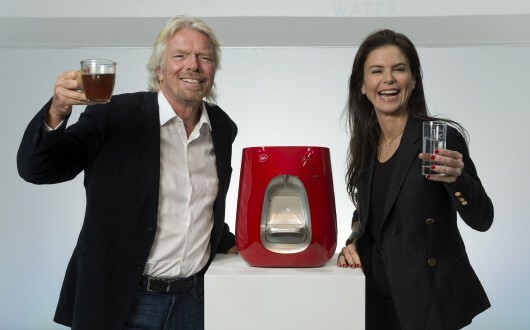 Virgin Pure water purifiers launch offensive against tap and bottled water in the UK originally appeared on Engadget on Wed, 30 May 2012 23:26:00 EDT. Please see our terms for use of feeds. 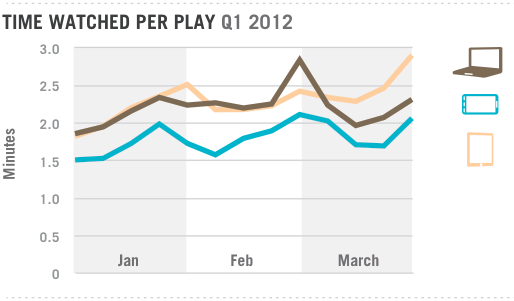 Video publishing platform Ooyala recently published its Q1 2012 state of online video report. The company powers videos for more than 1,000 online publishers, and collects anonymized viewing data from more than 200 million unique users per month. So it’s got a pretty good grasp on the state of online video. Here are several important trends the report points out. Longer videos. 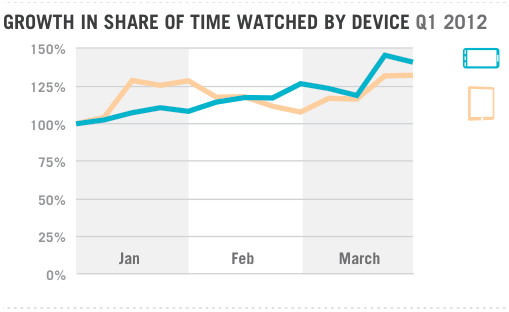 Viewers are watching longer videos on all devices, but especially on mobile devices. 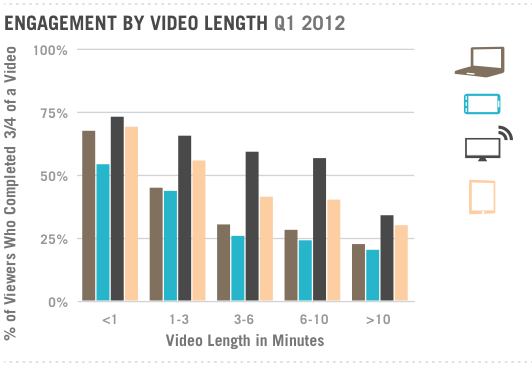 Long-form content, which they define as more than 10 minutes long, now accounts for 41 percent and 46 of time watched on smartphones and tablets, respectively. 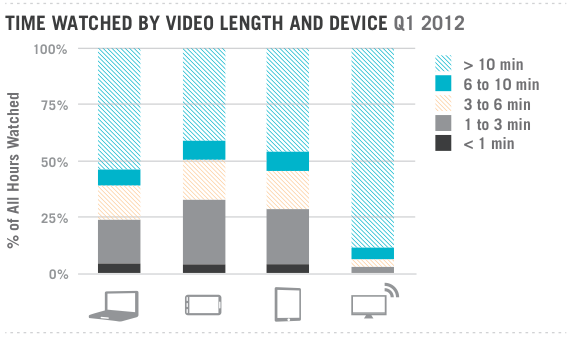 Huge growth in mobile video share. 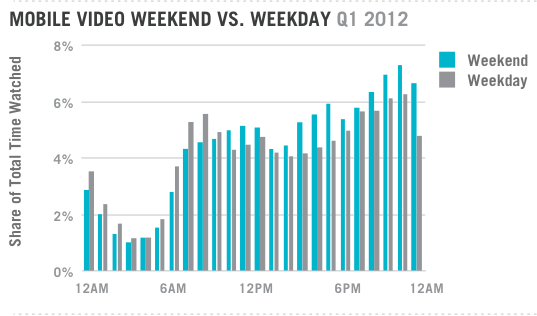 Mobile video gained a huge share of overall time spent watching videos in the first quarter. Smartphones gained 41 percent, while tablets grew 32 percent. 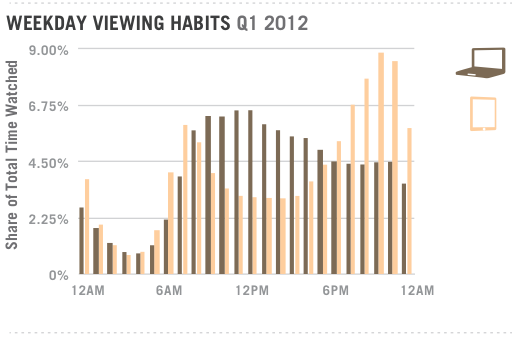 Smartphones’ share of overall time spent watching video also rises in the mornings and evenings, but the increase is less dramatic than tablets. Ooyala believes mobile video is not eating into traditional television, but consumers are using them as second (or third) screens. Finally: We can put to rest a long time industry excuse. It used to be that big time executives at companies like Yahoo, AOL, and Facebook could explain away ad revenues that weren’t big enough or growing fast enough by pointing out that so far, online ad spending has not been proportional to the amount of time consumers were spending online, and that this was bound to change, and when it did, boom times were ahead. The argument was: New York ad buyers are way behind the times, and they just don’t get it yet. Well, don’t look now, but according to this chart Mary Meeker’s latest presentation on the state of the Web, Internet ad spending, 22% of total ad spend, has just about caught up with time spent online, 26%. That ratio is fairly comparable to old mediums like TV (43/42) and Radio (15/11). Just the last time Meeker gave this presentation, the ratio was 16/22. Attention Facebook, Yahoo, and AOL execs: Your excuse has expired. Ad buyers are spending a commensurate amount of money on your medium as any other. Now your products have to perform better. 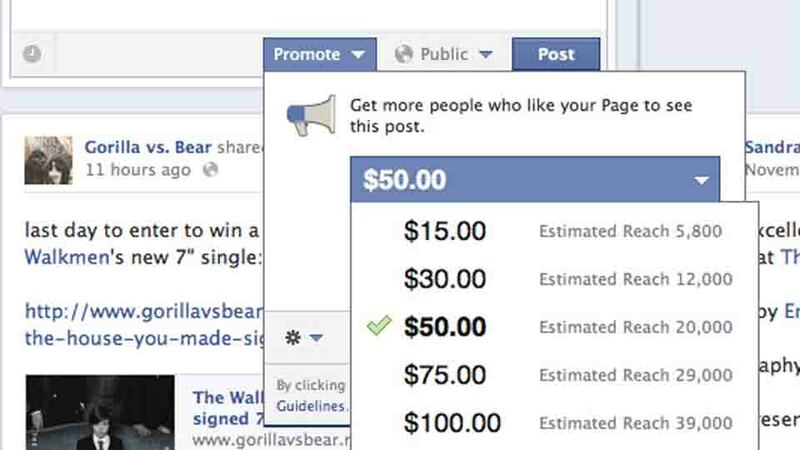 We’ve heard rumblings that Facebook was testing a system called Highlight that would allow people to pay to promote a post, and now obnoxiously enough, it’s starting to show up. Chris Cantalini, who runs a music blog called Gorilla vs. Bear, tweeted that he was posting a track by Holy Balm when he was presented with the above prompt. It asked him if he wanted to pay as much as $100 so that just one post, one song, could reach an estimated 39,000 people. For the record, only 37,000 people already Like Gorilla vs. Bear on Facebook.